Salsas was one of the first restaurants I dined at after moving to Asheville in 2000, and it is still here! I love the bright yellow color. I woke up early on a Sunday morning so that I could sketch it without cars blocking my view. Here is my sketch with pen added. I'm almost finished with the painting, and I'll be posting it soon! Pen drawing of Salsas in Asheville, NC. May 2017. Copyright © 2017 Jennifer Russ, All Rights Reserved. 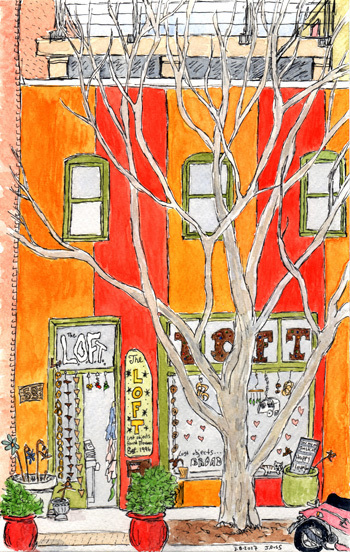 Here is one of my newest pen and watercolor paintings in my Asheville, N.C. series. The French Broad Chocolate Lounge, located near the Vance Memorial and The Asheville Art Museum in downtown Asheville. I love this place and I love how the painting turned out! Pen and watercolor. The French Broad Chocolate Lounge in Asheville, NC. May 2017. Prints and cards available. Copyright © 2017 Jennifer Russ, All Rights Reserved. I did sit outside The Chocolate Lounge to do the initial pencil sketch. It was a beautiful sunny day. A great day to be outside. Here is my sketch after I added pen. I have always loved this fun and funky store in downtown Asheville! And when I saw there was a bench across the street, I couldn't help but sit down and sketch it! With such great colors, it's hard not to notice this shop. Next time you are downtown, check it out! And pick up one of my postcards along with some of the other local artists cards that they have in the store!